A LAMP (Linux, Apache, MySQL, PHP) stack is a popular, free, and open-source web software bundle used for hosting websites on Linux. This software environment is a foundation for popular PHP application frameworks like WordPress, Drupal, and Laravel. 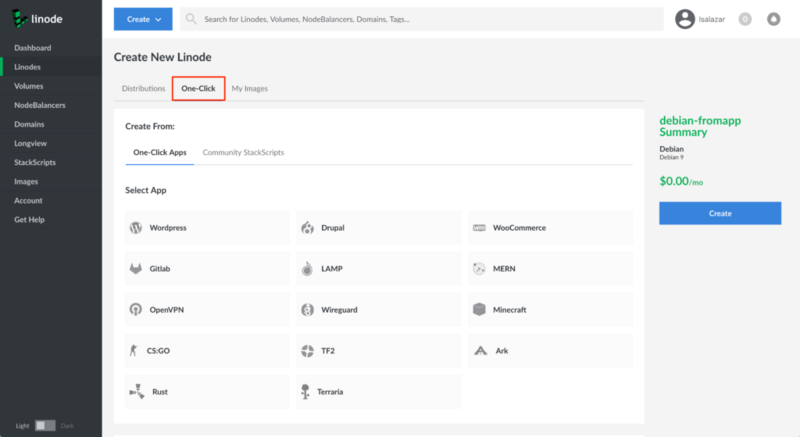 After you deploy your LAMP One-Click App, you can upload your existing PHP application code to it or use a PHP framework to write a new application on your Linode. The LAMP Stack Options section of this guide provides details on all available configuration options for this app. MySQL Root Password The root password for your LAMP stack’s MySQL database. This is not the same as your Linode’s root password. Required. Select an Image Debian 9 is currently the only image supported by the LAMP One-Click App, and it is pre-selected on the Linode creation page. Required. Linode Plan Your Linode’s hardware resources. The Linode plan you deploy your LAMP stack on should account for the estimated workload. If you are standing up a simple web page, you can use a Nanode or 2GB Linode. If you are standing up a larger or more robust web app, then consider a plan with higher RAM and CPU allocations. If you decide that you need more or fewer hardware resources after you deploy your app, you can always resize your Linode to a different plan. Required. When you’ve provided all required Linode Options, click on the Create button. Your LAMP Stack app will complete installation anywhere between 2-3 minutes after your Linode has finished provisioning. Connect to your Linode via SSH. You will need your Linode’s root password to proceed. Note that your Linode’s web root will be located in the /var/www/html directory. Navigate to the public IP address of your Linode in a browser. You will see the PHP settings that are active for your Linode. Upload files to your web root directory with an SFTP application like FileZilla. Use the same root credentials that you would use for SSH. Assign a domain name to your Linode’s IP address. Review the DNS Manager guide for instructions on setting up your DNS records in the Cloud Manager, and read through DNS Records: An Introduction for general information about how DNS works. Apache HTTP Server Web server that can be used to serve your site or web application. PHP 7 General purpose programming language. UFW (Uncomplicated Firewall) Firewall utility. Ports 22/tcp, 80/tcp, and 443/tcp for IPv4 and IPv6 will allow outgoing and incoming traffic. CakePHP is a popular and feature-rich PHP web framework. It solves many of the common problems in web development, such as interacting with a database, shielding against SQL injections, and generating view code. It adheres to the model-view-controller (MVC) pattern, which decouples various parts of the application, effectively allowing developers to work on different parts of the app in parallel. It also provides built-in security and authentication. To create a basic database app is a seamless process, which makes CakePHP useful for prototyping. However, you can use CakePHP to create fully developed web applications for deployment as well. In this tutorial, you will deploy an example CakePHP web application to a production environment. To achieve this, you’ll set up an example database and user, configure Apache, connect your app to the database, and turn off debug mode. You’ll also use CakePHP’s bake command to automatically generate article models. A server running Ubuntu 18.04 with root access and a sudo, non-root account, you can set this up by following this initial server setup guide. 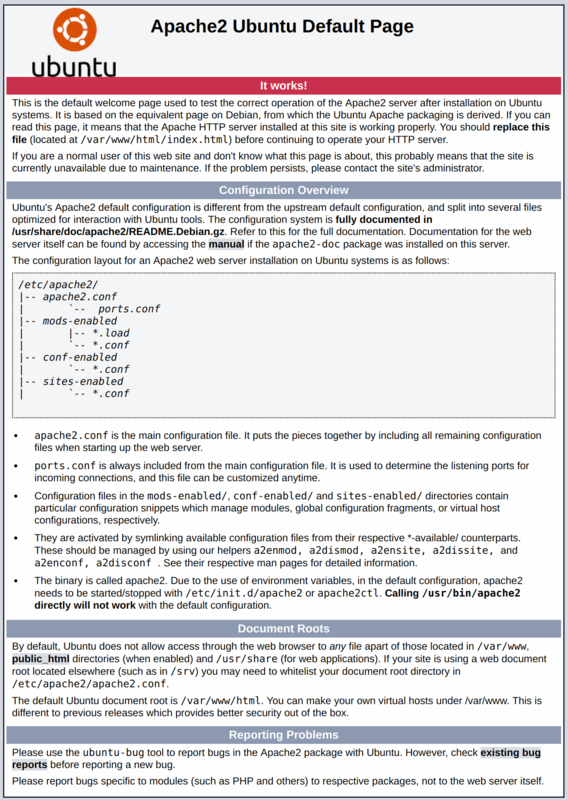 A LAMP stack installed according to How To Install Linux, Apache, MySQL, PHP (LAMP) stack on Ubuntu 18.04. At the time of this writing, PHP 7.2 is the latest version. Composer (a PHP package manager) installed on your server. For a guide on how to do that, visit How To Install and Use Composer on Ubuntu 18.04. You only need to complete the first two steps from that tutorial. Apache secured with Let’s Encrypt. To complete this prerequisite, you’ll first need to set up virtual hosts following Step 5 of How To Install Apache on Ubuntu 18.04. You can then follow How To Secure Apache with Let’s Encrypt on Ubuntu 18.04 to secure Apache with Let’s Encrypt. When asked, enable mandatory HTTPS redirection. To prepare for your application, you’ll begin by installing the PHP extensions that CakePHP needs. Remember that the version numbers above (7.2) will change with new versions of PHP. You installed the required dependencies for CakePHP. You're now ready to configure your MySQL database for production use. Now, you'll create a MySQL database to store information about your blog's articles. You'll also create a database user that your application will use to access the database. You'll modify the database privileges to achieve this separation of control. As a result, bad actors won't be able to cause issues on the system even with database credentials, which is an important security precaution in a production environment. When asked, enter the password you set up during the initial LAMP installation. Your CakePHP app will use this new database to read and store production data. id: is the unique identifier of an article, set up as a primary key. title: is the title of an article, declared as a text field containing a maximum of 50 characters. body: is the text of the article, declared as TEXT field. created: is the date and time of a record's creation. modified: is the date and time of a record's modification. You've added an example article with some sample data for the title and body text. This command grants all privileges to all the tables in the database. Remember to replace password with a strong password of your choice. You've just created a new database user, cake_user and given the user privileges only on the cakephp_blog database, thus tightening security. Exit the MySQL terminal by entering exit. You've created a new database with a schema, populated it with example data, and created an appropriate database user. 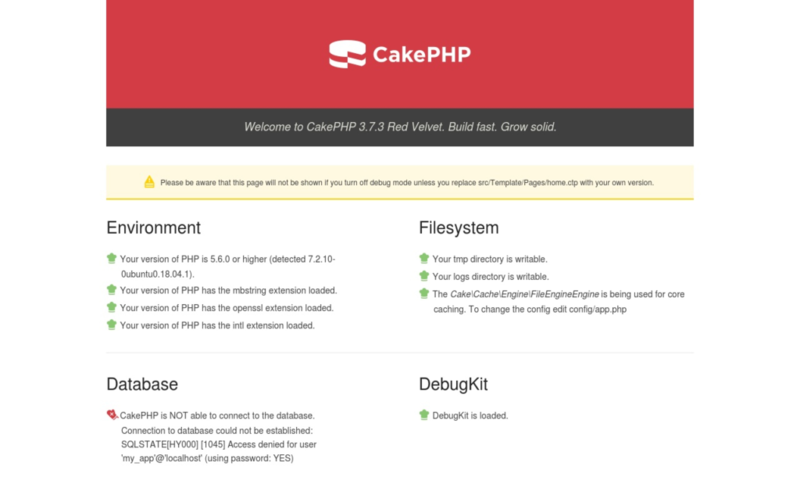 In the next step, you will set up the CakePHP app itself. In this section, you'll use Composer to install an example CakePHP app. It is advantageous to use Composer as it allows you to install CakePHP from your command line and it automatically sets up certain file permissions and configuration files. Here you have invoked composer and instructed it to create a new project with create-project. --prefer-dist cakephp/app tells composer to use CakePHP as a template with cake-blog as the name of the new application. Keep in mind that this command may take some time to finish. When Composer asks you to set up folder permissions, answer with y. In this section, you created a new CakePHP project with Composer. In the next step, you will configure Apache to point to the new app, which will make it viewable in your browser. Now, you'll configure Apache for your new CakePHP application, as well as enable .htaccess overriding, which is a CakePHP requirement. This entails editing Apache configuration files. For actual routing to take place, you must instruct Apache to use .htaccess files. These are configuration files that will be in subdirectories of the application (where needed), and then Apache uses the files to alter its global configuration for the requested part of the app. Among other tasks, they will contain URL rewriting rules, which you'll be adjusting now. Next, you will instruct Apache to point to the webroot directory in the CakePHP installation. Apache stores its configuration files on Ubuntu 18.04 in /etc/apache2/sites-available. 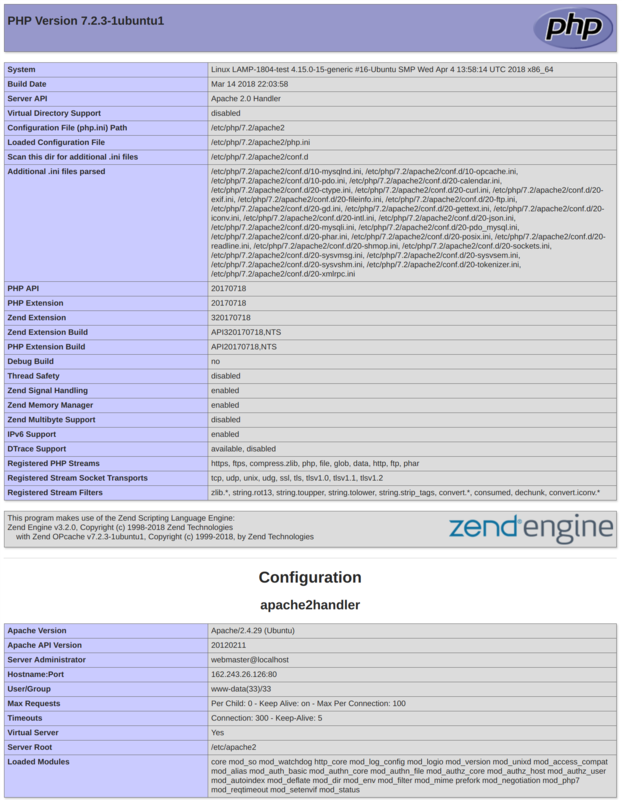 These files govern how Apache processes web requests. During the Let's Encrypt prerequisite tutorial, you enabled HTTPS redirection; therefore only allowing HTTPS traffic. As a result, you'll only edit the example.com-le-ssl.conf file, which configures HTTPS traffic. Now you can visit https://your_domain/ in your browser. You'll see the default CakePHP success page. You'll notice that there is a block indicating that your application can't connect to the database. In the next step you'll resolve this by connecting your app to the database. You've now enabled .htaccess overriding, and pointed Apache to the correct webroot directory. In this section, you will connect your database to your application so that your blog can access the articles. You'll edit CakePHP's default config/app.php file to set up the connection to your database. For 'username' replace my_app with your database user's username (this tutorial uses: cake_user), secret with your database user's password, and the second my_app with the database name (cakephp_blog in this tutorial). Refresh the app in your browser and observe the success message under the Database section. If it shows an error, double check your configuration file against the preceding steps. In this step, you've connected the CakePHP app to your MySQL database. In the next step, you'll generate the model, view, and controller files that will make up the user interface for interacting with the articles. In this section, you'll create a ready-to-use article interface by running the CakePHP bake command, which generates the article model. In CakePHP, baking generates all required models, views, and controllers in a basic state, ready for further development. Every database app must allow for create, read, update, and delete (CRUD) operations, which makes CakePHP's bake feature useful for automatically generating code for these operations. Within a couple of minutes, you get a full prototype of the app, ready to enter, store, and edit the data. Models represent the data structure. Views present the data in a user-friendly way. Controllers act upon user requests and serve as an intermediary between views and models. CakePHP stores its CLI executable under bin/cake. While it is mostly used for baking, it offers a slew of other commands, such as the ones for clearing various caches. By passing the all command, you are instructing CakePHP to generate models, controllers, and views all at once. It has properly detected the articles definition from your database, and is offering to generate files for that model. In the output, you will see that CakePHP has logged all the steps it took to create a functional boilerplate for the articles database. You'll see a list of articles currently in the database, which includes one row titled Sample Title. The bake command created this interface allowing you to create, delete, and edit articles. As such, it provides a solid starting point for further development. You can try adding a new article by clicking the New Article link in the sidebar. In this section, you generated model, view, and controller files with CakePHP's bake command. You can now create, delete, view, and edit your articles, with all your changes immediately saved to the database. In the next step, you will disable the debug mode. 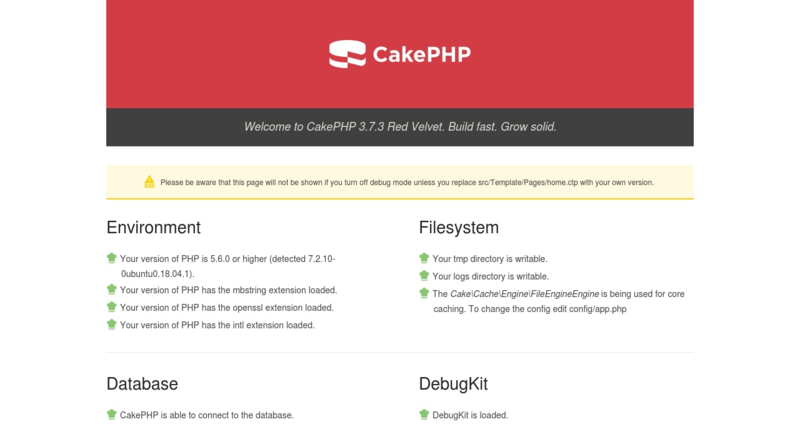 In this section, you will disable the debug mode in CakePHP. This is crucial because in debug mode the app shows detailed debugging information, which is a security risk. You'll complete this step after you've completed the development of your application. Once you've turned debug mode off, the home page, located under src/Templates/Pages/home.ctp, will show an error. Note: If you haven't changed the default route or replaced the contents of home.ctp, the home page of your app will now show an error. This is because the default home page serves as a status dashboard during development, but does not work with debug mode disabled. You've disabled debug mode. Any errors and exceptions that occur from now, along with their stack traces, won't be shown to the end user, tightening the security of your application. However, after, disabling debug mode, your home.ctp will show an error. If you've completed this step only for the purposes of this tutorial, you can now redirect your home page to the articles listing interface while keeping debug mode disabled. You'll achieve this by editing the contents of home.ctp. This HTML redirects to the Articles controller. If the automatic redirection fails, there is also a link for users to follow. In this step, you disabled debug mode for security purposes and fixed the home page's error by redirecting the user to the blog post listing interface that the Articles controller provides. You have now successfully set up a CakePHP application on a LAMP stack on Ubuntu 18.04. With CakePHP, you can create a database with as many tables as you like, and it will produce a live web editor for the data. The CakePHP cookbook offers detailed documentation regarding every aspect of CakePHP. The next step for your application could include implementing user authentication so that every user can make their own articles.